The control unit with touch screen EST3 is a suitable control element of the iNELS system in places where it is necessary to control multiple devices. The unit replaces several drivers and enables minimizing the number of switches on the wall. EST3 features a 3.5 "color touchscreen with an aspect ratio of 3:4. The basic display resolution is 240 x 320 pixels. The color depth of 16.7 million colors (24 bit color, True Color). Use the touch sensing surface to control confi gured buttons and symbols on the screen just by a light touch of a finger. Individual symbols on the screen are in the "Press" animated by the associated output in the system. Buttons screen can be set in the menu and can be optionally confi gured according to user requirements . There are four basic templates of buttons matrix - 2x2, 2x3, 3x3 and 3x4 . The screen can then have up to 12 buttons to control up to 12 appliances or scenes. In the configuration buttons menu, it is possible to assign a symbol (icon) of the preset menu to individual keys from the selected templat (48 diff erent symbols - bulb, blinds, party scene, etc. ), possibly write to the button three alphanumeric characters. The temperature control screen enables correction of the temperature of the selected heating circuit in the range of ± 5 ° C, or entering of the desired temperature in absolute value. The virtual wheel can be used for temperature correction, where you can drag your finger across the screen to control the temperature by half a degree Celsius. The temperature correction can also be used instead of the virtual wheel symbols "+" and "- " . EST3 units do not have an integrated temperature sensor, or terminals for connection to an external temperature sensor. Within the IDM software, it is possible to assign any unit of heat input system iNELS. 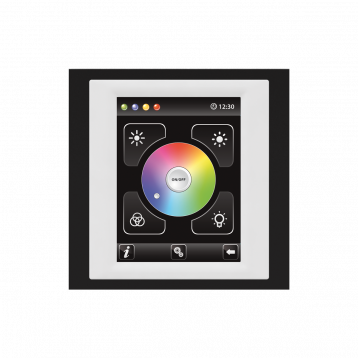 The control RGB light sources screen allows you to comfortably control your RGB light sources and adjust the luminous atmosphere as needed. 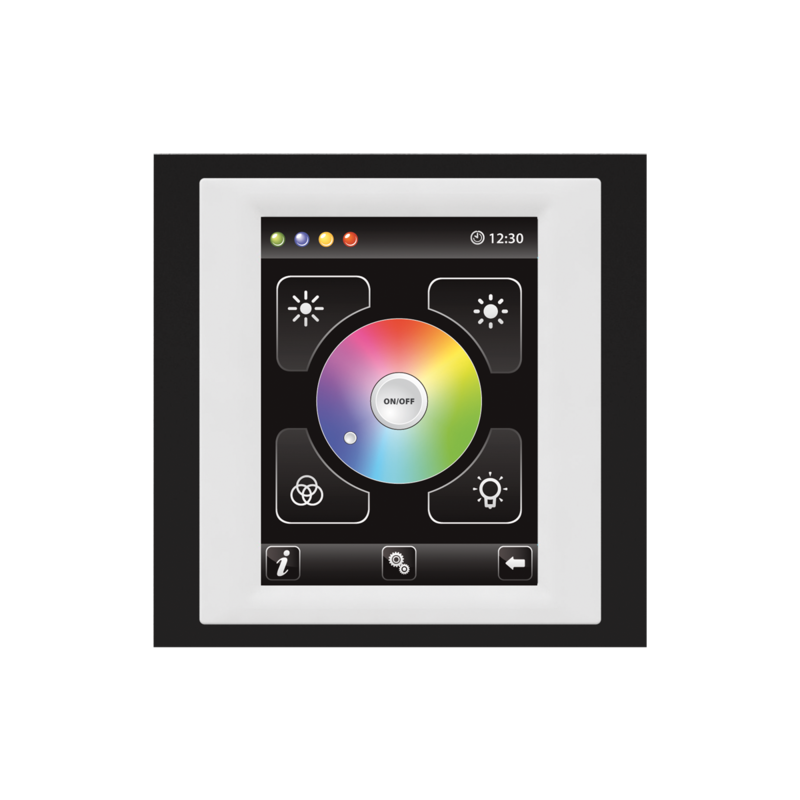 For these RGB light sources, it is possible to use the controls on the screen to adjust the color and brightness. It is also possible to directly set the RGB illumination light source into white color. Located in the left upper corner of the screen are 4 indicators that can signal the status of any logical input / output in the iNELS system. In the settings menu, you can defi ne the language menu, screen saver, sleep mode, brightness settings, select the default display and devices display mode of EST3. Unit EST3 is on the BUS represented by one hardware address. EST3 are designed as LOGUS90 devices (EST3 however cannot be placed into multiframes with other devices in this design) and are intended for mounting to installation box.